Outside of a few sure-bet favorites, I was I think pretty typical in my comic book purchasing habits: I would pick up whatever looked good among what was available on whatever outing made it possible for me to purchase a comic book. At this point, I knew that what I wanted was super heroes (and that the Marvel books weren’t to my liking) but apart from that, everything was wide open. 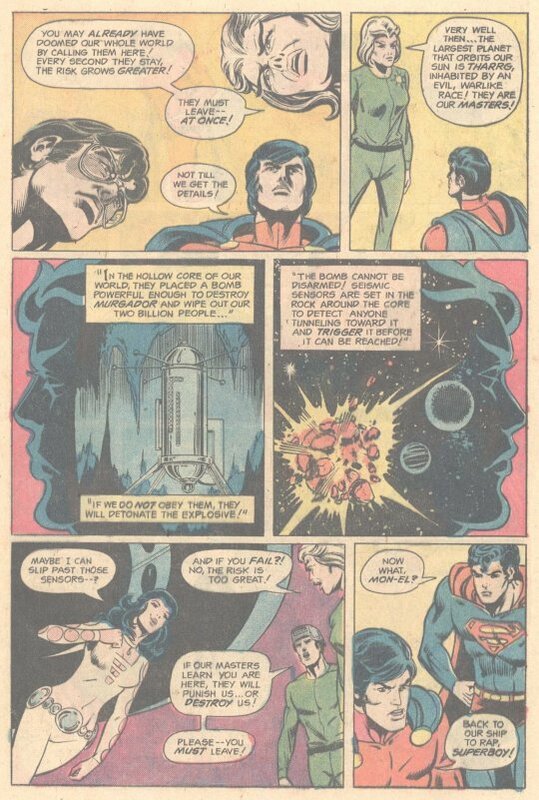 And so the next comic book that I acquired was this issue of SUPERBOY AND THE LEGION OF SUPER-HEROES–again, despite the fact that it was one of the titles whose stories I recognized as somehow being “wrong” (i.e. not catering to my Julie Schwartz-honed tastes.) I suppose it was an attempt to figure out just what was so different about these titles, and an eternal optimism that they would suddenly “correct” themselves. This was another story written by the recently-returned Jim Shooter. One of the greatest Legion writers despite his youth–he was only 13 years old wen he sold his first stories to editor Mort Weisinger–he had left comics and entered the “real” workforce, only to return again a few years later. 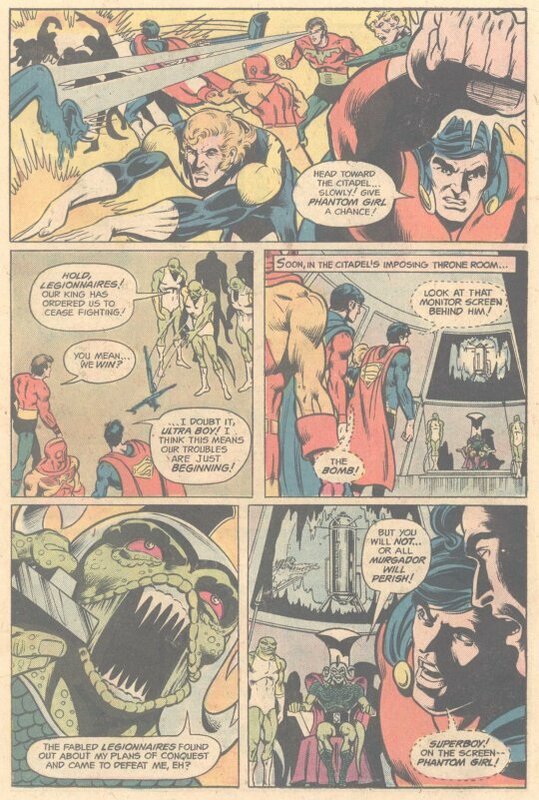 At this point, he was still finding his feet, having to share the LEGION assignment with fellow writer Cary bates on an alternating basis, and not always clicking with current LEGION editor Murray Boltinoff. Still, Shooter knew the Legion, and the characters always seemed correct under his stewardship, even as he gave them weird emotional hang-ups and often hair-trigger tempers. Like Superboy’s both on the cover and the splash page. This was very much in the Mort school of dramatic overacting. It’s also a complete story in only 12 pages, which is something than many contemporary writers would struggle with. After the symbolic splash, we open on the planet Murgador, where a team of Legionnaires has come in response to an urgent summons. But they’re attacked by the workers when they touch down–Wildfire has a brick caroomed off of his helmet–and when they calm people down, they discover that the call for aid came from a dissident, and that while the entire planet is held in abject slavery, a bomb planted at the core of the planet will be detonated if anyone disobeys, or if anyone tries to disarm it, completely obliterating bot Murgador and its two-billion inhabitants. Departing, the Legion is split as to what course of action to take. Phantom Girl insists that, in her immaterial form, she can get to the explosive undetected and disarm it, but it’s a frightful risk to take. Some of the other Legionnaires argue that the majority of the citizens don’t want their help, don’t want to take the risk–what right do they have to go against the will of the majority? 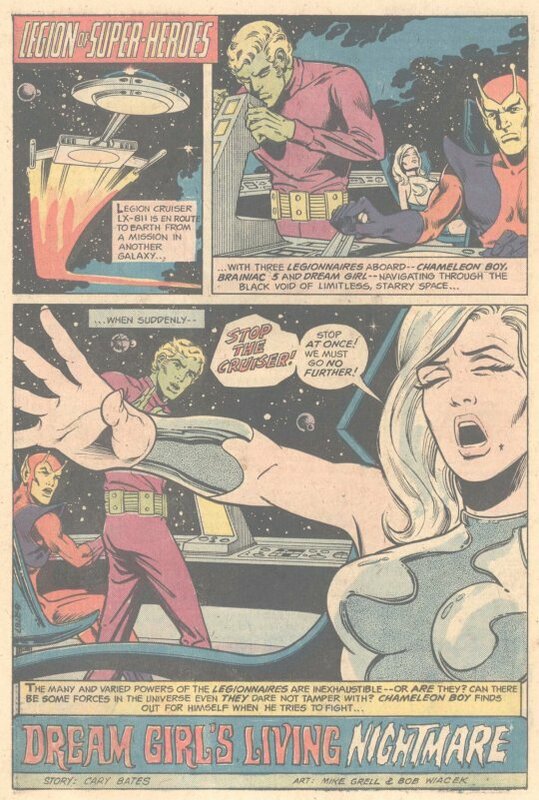 But Phantom Girl isn’t having it, and she dives from the Legion Cruiser into the surface of Murgador. With no other course of action available to them, the remaining legionnaires stage an attack on the slaver’s world of Thargg in the hopes of distracting anybody who might notice Phantom Girl’s approach and destroy the planet. After some fun if ineffectual action, the Legion are escorted to the Slaver king, who holds the detonator in his hand and has a big television tuned to the bomb on a monitor behind his head. 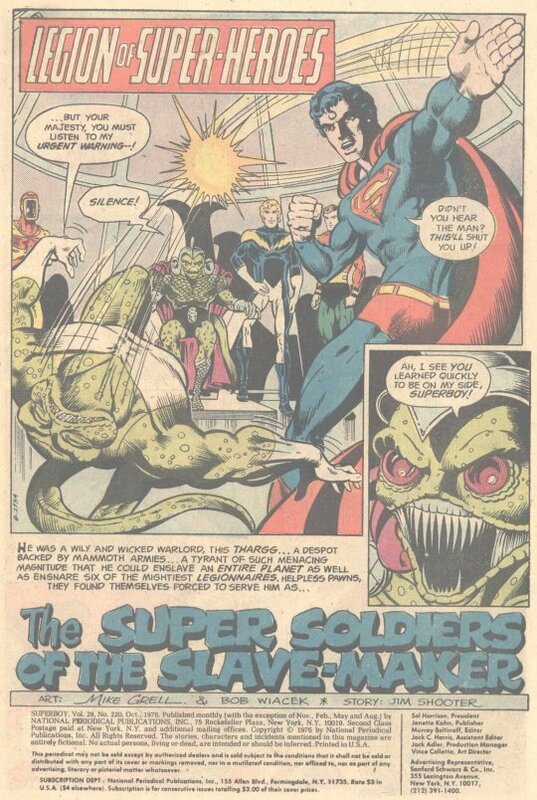 The Legionnaires see Phantom Girl making her approach–and this is why Superboy angrily smacks down one of the rank-and-file as he does on the splash page–to prevent him from alerting the King. Unfortunately. Phantom girl isn’t quite as good as she thought she was, and the bomb detects her, and the screen goes black. 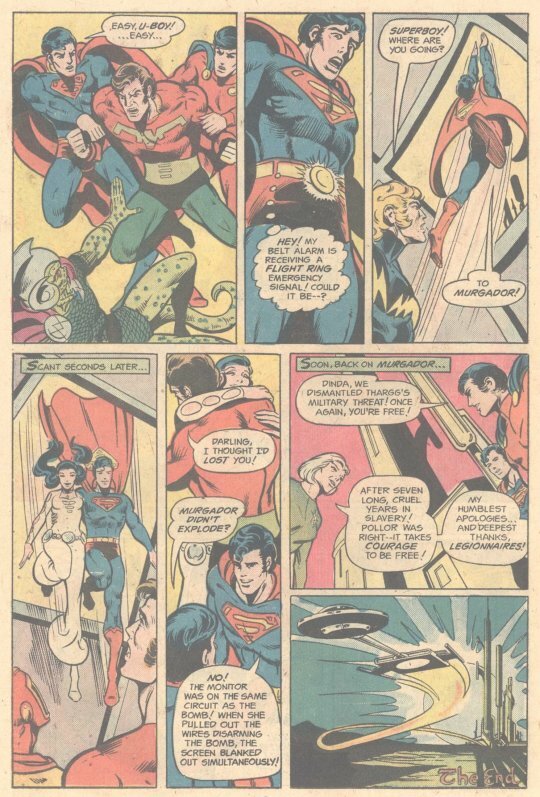 Grief-stricken, Ultra Boy goes berserk and has to be restrained by Mon-El and Superboy–before Superboy picks up a Legion signal and flies out to return with Phantom Girl. Apparently, her last-second attempt to pull wires randomly did stop the bomb, as well as shorting out the camera. I always liked this shot of Superboy and Phantom Girl alighting from the last page of the story, for some reason. Cary Bates handles the back-up story, and he’s got only 5 pages in which to operate, a daunting prospect for any writer. But he gives it his best. Returning to Earth from a mission in deep space, a trio of Legionnaires are halted in their tracks by one of Dream Girl’s prophetic visions: the beloved Primor of nearby Demros II is going to be assassinated–but Dream Girl can’t identify the assailant. (if she could, this would have been an even shorter story, but as usual, Dreamy can’t give the Legion any info that would prove to be too useful. ), only that the weapon used had three circles. 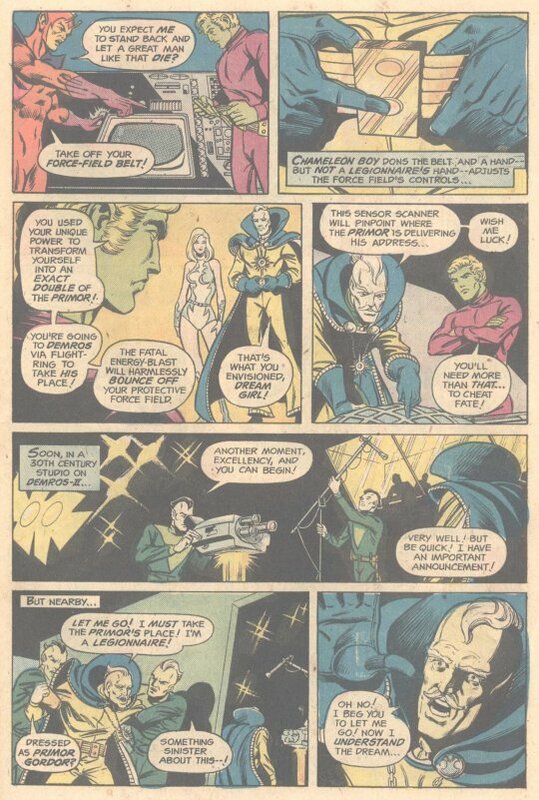 Brainiac 5 insists that whatever Dream Girl saw is an immutable fact, but Chameleon Boy plans to trick destiny by making himself into te likeness of the Primor and taking his place, carrying Brainiac 5′s force-field belt to ward off the attack. But the head of the Legion Espionage Squad is just as much a klutz as Phantom Girl, and he gets stopped before he can take the Primor’s place at a big planetwide broadcast–and yes, the weapon is the camera, which looks like something from the 1950s not the 30th Century, but whatever. Down goes the Primor–except that he’s not the Primor, but a despot who was seeking to overthrow the true Primor and rise to power, and he’s killed by one of the Primor’s loyal subjects. Despite having done nothing but almost foul up the plan, Chameleon Boy accepts the Primor’s handshake like a true hero before flying off–presumably hoping that nobody will find out about his gaffe here.